We have included the data file, which can be obtained by clicking on discrim.sav. The dataset has 244 observations on four variables. 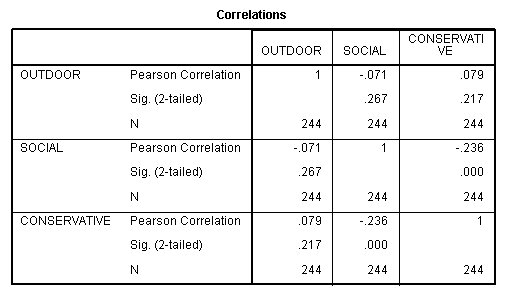 The psychological variables are outdoor interests, social and conservative. 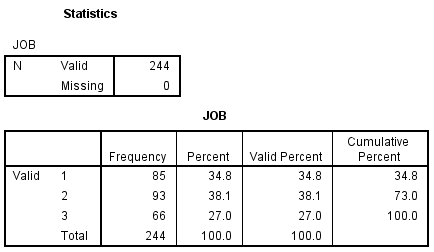 The categorical variable is job type with three levels; 1) customer service, 2) mechanic, and 3) dispatcher. 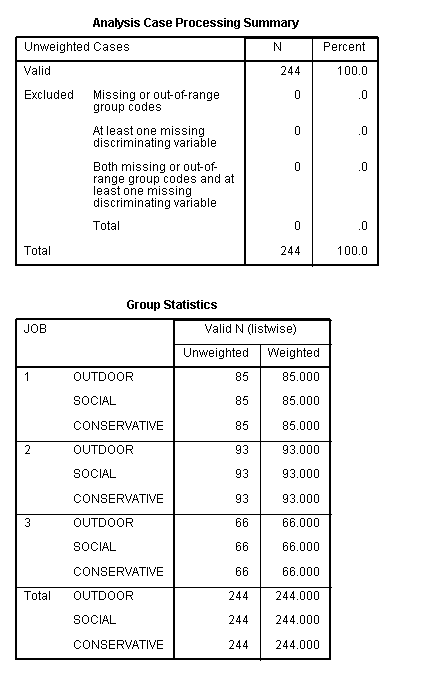 means tables=outdoor social conservative by job. 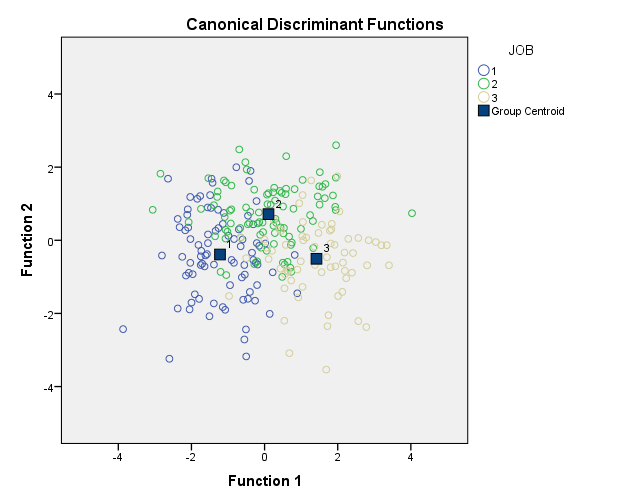 Discriminant function analysis – This procedure is multivariate and also provides information on the individual dimensions. MANOVA – The tests of significance are the same as for discriminant function analysis, but MANOVA gives no information on the individual dimensions. We will run the discriminant analysis using the discriminant procedure in SPSS. There is a lot of output so we will comment at various places along the way. The output above indicates that all 244 cases were used in the analysis. 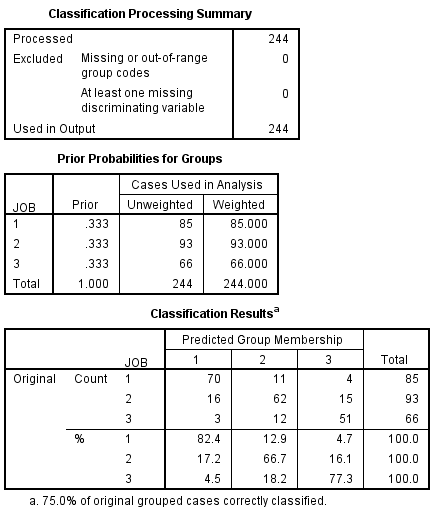 We also see the number of cases for each outcome variable at each level of the grouping variable. 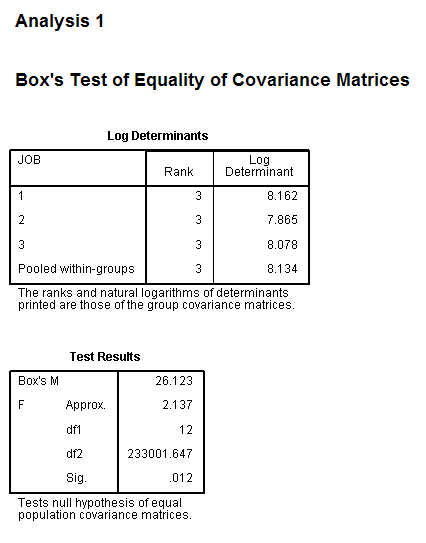 Box’s test of equality of covariance matrices can be affected by deviations from multivariate normality. 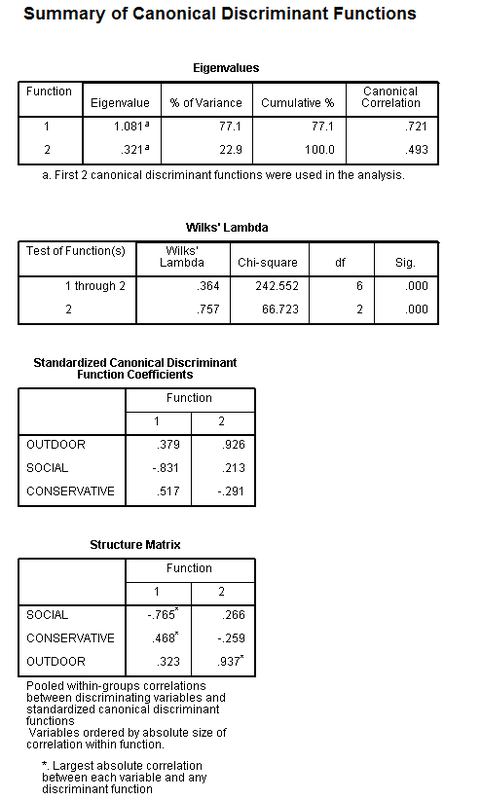 Note that the Standardized Canonical Discriminant Function Coefficients table and the Structure Matrix table are listed in different orders. In this example, there are two discriminant dimensions, both of which are statistically significant. The standardized discriminant coefficients function in a manner analogous to standardized regression coefficients in OLS regression. For example, a one standard deviation increase on the outdoor variable will result in a .32 standard deviation decrease in the predicted values on discriminant function 1. The canonical structure, also known as canonical loading or discriminant loadings, represent correlations between observed variables and the unobserved discriminant functions (dimensions). The discriminant functions are a kind of latent variable and the correlations are loadings analogous to factor loadings. 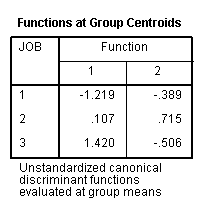 Group centroids are the class (i.e., group) means of canonical variables. The default is equal prior probabilities. Next, we will plot a graph of individuals on the discriminant dimensions. Due to the large number of subjects we will shorten the labels for the job groups to make the graph more legible. As long as we don’t save the dataset these new labels will not be made permanent. As you can see, the customer service employees tend to be at the more social (negative) end of dimension 1; the dispatchers tend to be at the opposite end, with the mechanics in the middle. 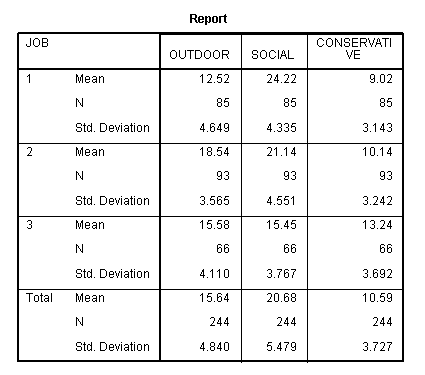 On dimension 2 the results are not as clear; however, the mechanics tend to be higher on the outdoor dimension and customer service employees and dispatchers lower. SPSS also produces an ASCII territorial map plot which shows the relative location of the boundaries of the different categories. The territorial map is shown below. 4.0 . 112       .         .         .         . 223      . 2.0 .          .       112         .         .  233    .          .
.                        122    *     233                     . .0 .          .         .      122. 233   .         .          .
.                        *   112 223                          . -2.0 .          .         .         13        .         .          .
-4.0 .          .         .         13        .         .          .